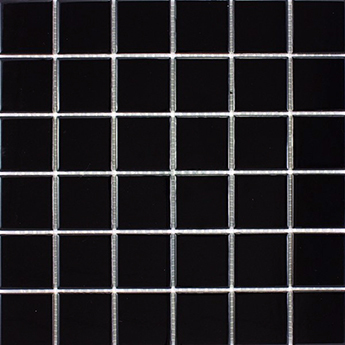 With a timeless black colour these mosaic squares are a versatile choice for bathrooms and kitchens. You can combine these tiles with lighter colours for chic and contemporary interior designs. The emphatic black colour is accentuated by a highly polished finish. They can be used to create sophisticated splash back features above worktops and are also an exquisite option for a border tile on walls. These premium quality porcelain tiles have a sleek and smooth surface which allows for easy cleaning and maintenance. Furthermore, they are scratch and stain resistant. Mosaics have been used as part of interior decors since the Ancient Roman times and these tiles are a modern adaptation of a traditional style.